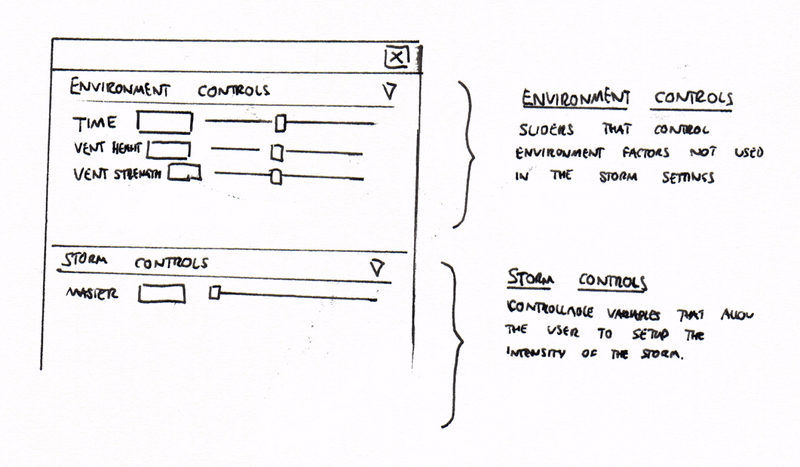 I have drawn up an idea of how I’d like to set-up my environment. I’d also like to allow the user to be able to activate the storm on and off via a separate window. The interface could include sliders for things such as the time of day, intensity of the clouds and dust, or the turbulence and nature of any wind in the scene. I am thinking about creating a storm script which would run off an expression. This expression would use the slider settings and generate the storm scene. The storm itself would likely be ramping up and down air turbulence, adding in sudden wind gusts and varying the degree of dust in the scene. The tool and scene together would create a helpful tool for the user to set-up different scenes. For example if this was a CGI scene in a movie, the layout artist could quickly set-up how the weather is on that planet. Unfortunately I don’t think the tool could be used to dynamically change the weather in a scene. I would need to be able to bring in the weather from off-screen and more work would be required to get this advancing weather front to look natural. I will focus on purely allowing the sliders to set-up the scene beforehand where it looks good constantly playing. The storm script itself will vary the intensity based on settings.